In April 1941, the U.S. Navy opened its new base at Bermuda, obtained (among other concessions) in exchange for the transfer of 50 overage destroyers to Britain’s Royal Navy. President Franklin D. Roosevelt made it the prime operating base for the new Central Atlantic Neutrality Patrol, initially consisting of the carrier Ranger, the cruisers Tuscaloosa and Wichita, and the destroyers Kearny and Livermore. In May the carrier Wasp joined them, along with the cruisers Quincy and Vincennes and seven destroyers. In June the carrier Yorktown arrived from the Pacific Fleet, escorted by five destroyers. All of these forces appear in Second World War at Sea: Bismarck, along with additional battleships, cruisers and destroyers. While Yorktown and Wasp are familiar to players of our other games set in the Pacific theater, the aircraft on their decks are radically different. A flight of Yorktown’s barrels. By 1942, American fighter squadrons were operating the Grumman F4F Wildcat, a small but tough low-wing monoplane. While not the equal of the Mitsubishi A6M Zero flying from Japanese carriers, it could at least put up a good fight in the hands of a skilled pilot. But the plane only started to come into service in the middle of 1941, and none of them were in use when Bismarck made her famous raid. When American carriers went out into the Atlantic in search of German surface raiders, their fighter squadrons still operated the F3F “Flying Barrel.” Fifty-four of the short, stubby fighter had first been ordered in 1935 for carrier service, with 81 more improved F3F-2 planes purchased in 1937 when the Brewster F2A Buffalo monoplane fighters the Navy hoped to buy instead failed to materialize in time. A final order for 27 F3F-3 aircraft was delivered in 1939. Though very similar in design to the previous F2F, the F3F had many modern features: retractable landing gear and a variable-pitch propellor, both firsts for the U.S. Navy. Pilots loved the highly manueverable machine, and considered it the epitome of fighter design (a feeling common to those who flew last-generation biplanes; tragically, the Italian Air Force actually listened to their pilots and kept their nimble Cr.42 biplanes). Lightly armed like other fighters of its type, the F3F had only two machine guns but did have racks for small bombs. As its replacement, the initial F4F design was an improved biplane. When Grumman appeared likely to lose the contract to Brewster, its engineers recast their plane as a low-wing monoplane that became the Wildcat. But it still carried many features of the F3F biplane: The undercarriage was identical, and it also had the broad barrel-shaped body. By the time of the Pearl Harbor attack, all of the F3F squadrons had re-equipped with F4F Wildcats. 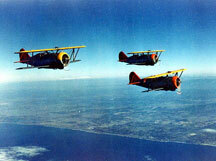 The biplanes continued as training aircraft for several years, but never saw combat. For scouting and attack, most of the Navy’s carriers stationed in the North Atlantic operated the Northrop BT-1 dive bomber. Pilots disliked it for its poor handling characteristics, especially in a dive; deck crews liked it even less as it lacked folding wings. The older Vought SB2U Vindicator therefore was not fully phased out of service, while the Navy ordered an improved version of the BT-1. Douglas Aircraft Corp. took over Northrop while the plane was in development, and Jack Northrop completed the BT-2 as the SBD Douglas Dauntless. Like the F3F, the BT-1 had been removed from service by the time of Pearl Harbor, but unlike the biplane its wicked handling sent it straight to the boneyard. The Douglas TBD Devastator had been the Navy’s standard torpedo bomber since 1937, and it had been outdated when introduced. It remained on carrier decks into 1942, when Hornet’s Devastator-equipped Torpedo Squadron Eight made its heroic sacrifice at the Battle of Midway. It was a painfully slow aircraft, barely topping 200 miles per hour, with range about standard for the carrier air group of its day but not up to the standards of the Pacific War. The Devastator first flew in 1935, and by late 1939 129 of them had been delivered. Navy pilots considered it a high-performance aircraft and a technological leap forward. It was a comparatively large plane for the day, as were all torpedo bombers, and could carry a large bomb load instead. At Midway, 41 Devastators from three carriers attacked the Japanese fleet. Four of them returned. The TBG-1, loser in the torpedo bomber competition. It could have been far worse. The Navy chose the Devastator over the Great Lakes TBG-1, a bizarre (and very large) biplane torpedo bomber with three separate cockpits (the bombardier has one below the engine, not visible in the photo). American forces did not openly engage German surface raiders, but they would have had they met. The American carriers and their aircraft appear in a number of scenarios in our Bismarck game, both historical and hypothetical engagements. While their aircraft are shockingly primitive compared to those of games set later in the war, the German carrier Graf Zeppelin would likely have been operating biplane fighters and torpedo bombers at this point in the war had she been completed on schedule, while British carriers had a biplane torpedo bomber and a few had biplane fighters. Click here to order Bismarck Second Edition. Please allow an additional six weeks for delivery. Mike Bennighof is president of Avalanche Press and holds a doctorate in history from Emory University. A Fulbright Scholar and award-winning journalist, he has published over 100 books, games and articles on historical subjects. He lives in Birmingham, Alabama with his wife, three children and his dog, Leopold. Leopold fears biplanes.